Exclusive: 4 Years After BP Disaster, Ousted Drilling Chief Warns U.S. at Risk of Another Oil Spill | Democracy Now! staff attorney for the Center for Biological Diversity. Four years after BP’s Deepwater Horizon drilling platform exploded and killed 11 workers, causing more than 200 million gallons of oil to spew into the Gulf of Mexico, the Environmental Protection Agency has lifted a ban that excluded BP from new federal contracts. In a broadcast exclusive, we speak with Elizabeth Birnbaum, who was director of the Minerals Management Service in the Interior Department at the time of the Deepwater Horizon blowout. She was forced out soon after. In her first broadcast interview since her departure, Birnbaum warns the risk of another offshore oil drilling blowout is real. We are also joined by Jaclyn Lopez, staff attorney for the Center for Biological Diversity. AMY GOODMAN: Sunday marked the fourth anniversary of what’s been called the worst man-made environmental disaster in U.S. history. It was April 20th, 2010, when an explosion and fire on BP’s Deepwater Horizon drilling platform killed 11 workers and caused more than 200 million gallons of oil to spew into the Gulf of Mexico. Today, oil continues to wash up on some of the beaches of Louisiana, despite claims made by Gulf Coast residents featured in BP’s television advertisements like this one. GULF COAST RESIDENT 1: Yeah, last summer I saw certain spots where oil would pool up on the beaches, on the shores. And we saw cleanup crews every day, in my opinion, doing a good job. GULF COAST RESIDENT 2: It’s as good as it’s ever been. I’ve been here since 1991, and I’ve never seen our beaches look better. GULF COAST RESIDENT 3: I honestly kind of expected it, our beach, to be messed up for a while and really to see the effects of it. But, I mean, it’s nice and clean, as you can see. AMY GOODMAN: That’s an ad by BP. The oil company says it spent more than $14 billion responding to the spill and cleaning the coastline, and it recently announced it’s ending its “active cleanup” in Louisiana. Similar operations ended last summer in Alabama, Florida and Mississippi. 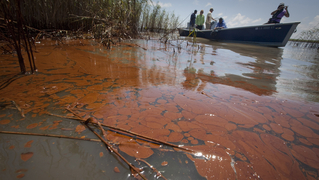 Meanwhile, last month the Environmental Protection Agency lifted a 2012 ban excluding BP from new federal contracts. The ban was put in place after the EPA found the company failed to fully correct problems that led to the well blowout in 2010. BP had sued to have the suspension lifted. The consumer advocacy group Public Citizen said in a statement the settlement, quote, “lets a corporate felon and repeat offender off the hook for its crimes against people and the environment.” Just days after the ban was lifted, during an auction in New Orleans, BP bid $42 million to win 24 new leases in the Gulf of Mexico. Well, in a broadcast exclusive, we’re joined now by Elizabeth Birnbaum. She was director of the Minerals Management Service at the time of the Deepwater Horizon blowout. She’s now a consultant at SEB Strategies. She recently co-wrote an op-ed for The New York Times headlined “The Deepwater Horizon Threat,” where she expresses concern that, quote, “The risk of another blowout is real. Offshore wells have lost control several times in the [past] year,” she said. This is Birnbaum’s first broadcast interview since she left the Department of Interior shortly after the BP spill. She’s joining us from Washington, D.C.
Liz Birnbaum, welcome to Democracy Now! Talk about this risk you have written about four years after the BP spill. ELIZABETH BIRNBAUM: Well, after the spill, there were a number of investigative reports by various experts looking at what had caused the spill and how it might be prevented in the future. One of the key reports was done by the National Academy of Engineering. Experts on engineering looked at all aspects of what had caused the spill, and they looked at the decision making on the oil rig which had led to loss of control of the well. But they also looked at what happened with the blowout preventer. The blowout preventer is a huge piece of equipment that sits on the seafloor, and it’s designed to do what its name says: stop a blowout as it comes up the well, be able to cut off any oil and gas coming out of the well. What the National Academy of Engineering found was that the blowout preventers aren’t actually well engineered to do that, and they found a number of failings within the blowout preventers. The administration has several times indicated that they were going to adopt new regulations to require blowout preventers that would actually prevent this kind of an accident, but in fact they’ve never even put out a draft regulation, and it’s now two-and-a-half years since we heard from the National Academy of Engineering. AMY GOODMAN: And your response, Liz Birnbaum, to the EPA lifting that 2012 ban on BP getting new federal contracts? They just bid for a bunch more. ELIZABETH BIRNBAUM: I believe that EPA is bound by some federal laws that allowed BP to go back into the business; however, there are ongoing concerns about BP’s practices over the years. They were of course involved in the major Texas chemical plant incident previously, and so there are a number of questions about their business practices, and certainly it deserves a good look. AMY GOODMAN: Can you talk about your controversial time, certainly, with this blowout that occurred? You left soon after, the reports then, as you were forced out just before you were to testify with Ken Salazar, who was then the head of the Department of Interior, before Congress. What happened at that time? ELIZABETH BIRNBAUM: At that time, I left the administration at the request of the interior secretary, who asked for my resignation. Since then, I’ve been monitoring what’s been going on and trying to determine if there is a way to prevent future accidents of this kind. I thought any issues about my resignation were a distraction from the real questions at the time, which were we didn’t know why the spill had occurred, and we needed to learn about it and take the lessons from it. AMY GOODMAN: In a press statement BP released earlier this month, the company said it’s expended $14 billion and 70 million man-hours on the cleanup effort. The statement went on to say, quote, “The large-scale cleanup effort, combined with early restoration projects and natural recovery processes, is helping the Gulf return to its baseline condition, which is the condition it would be in if the accident had not occurred.” They went on to say, “From the beginning, BP worked under the Coast Guard’s direction and in cooperation with state agencies and local governments to limit the accident’s impact on the environment, and remove oil from the water and shoreline.” Liz Birnbaum, are you assured? ELIZABETH BIRNBAUM: There are continuing reports about oil along the coast, particularly in the marshes. Those are areas that are hard to reach, but those are the areas that are essential to keeping Louisiana’s coastline intact, and in fact have been deteriorating for many years. But there are certainly reports that there are still many miles of coastal marshes where you can find oil and where that’s contributing to the death of the marshes. AMY GOODMAN: You’ve talked about the blowouts or the offshore wells that have lost control several times just in the last year. Can you talk more about that? ELIZABETH BIRNBAUM: Certainly. A few of these have been temporary losses of control where there was unexpected pressure coming up a well and the operator was able to get it under control fairly quickly. But there was at least one incident last year in July where a natural gas well, which was not spewing oil, luckily did not pollute the Gulf, but was emitting high-pressure natural gas, actually caught on fire, caught the rig on fire, and it took them two days to put it out and to stop the flow of gas from the well. That’s the kind of incident which a blowout preventer or a similar device should be able to stop, and it’s the kind of incident that the Department of the Interior should be trying to prevent through new regulation. AMY GOODMAN: The administration’s recent proposal to use these seismic air guns to search for oil along the Atlantic Coast? ELIZABETH BIRNBAUM: Yeah, that’s a new proposal to search for additional oil and gas. They just completed the environmental impact statement looking at that, and they determined that the use of these seismic air guns, which basically emit huge sound explosions under sea repeatedly over miles of survey area, would have significant impacts on marine life and, in particular, would actually cause thousands of deaths among dolphins and whales. The concern about that is that the National Oceanic and Atmospheric Administration is actually in the process of issuing new guidelines for exactly this kind of activity and how to avoid impacts on dolphins and whales. That came out in draft in December, and the Department of the Interior shouldn’t be going forward with the new seismic testing until after NOAA’s new guidelines have been peer-reviewed and finalized. AMY GOODMAN: And do you have regrets, any regrets, from your time at the Department of Interior heading up the Minerals Management Service? ELIZABETH BIRNBAUM: I have enormous regrets. On my watch, we had the most devastating accident we’ve had offshore. Eleven men died. And we had an enormous pollution event in the Gulf of Mexico, which is perhaps the worst environmental disaster in U.S. history, as you suggested. I believe that we need to continue to work to make our regulation of offshoring oil and gas better and to make sure that we can prevent incidents like that in the future. AMY GOODMAN: Finally, the issue of the human factor, reducing the human factor, how do you do that? ELIZABETH BIRNBAUM: Well, there were, again, a number of reports which looked at what happened on the rig when they made poor decisions, looked at the data from the well and decided that they would ignore tests that suggested that the well wasn’t under control. Those are decisions that were made probably because of very human factors about the fact that they had discovered a huge reservoir of oil and they wanted to move forward on it very quickly. The only solution to that is to have monitoring by people who are not so integrally involved. The Interior Department has proposed having the data from the wells sent onshore to Interior Department personnel for any new wells being drilled in the Arctic. I really don’t understand why they haven’t done that for any well in deep water in the Gulf, as well. Those are ones where there are huge risks and where if you simply had somebody onshore monitoring the data, you would know whether or not there were risky decisions being made on the rigs. The co-author of the piece [sic] was Jaclyn Lopez. Jaclyn Lopez is a staff attorney with the Center for Biological Diversity. She’s joining us from Tampa, Florida, from PBS station WEDU. Jaclyn, what do you think is critical for us to understand right now, on this fourth anniversary of the BP oil spill, about the state of the environment now along the coast? JACLYN LOPEZ: Good morning, Amy. Yes, well, first I have to make a correction: I was not the co-author on that New York Times editorial. But we do have remaining concerns about the health of the Gulf. So, we all live here because of the remarkable diversity of wildlife that we have, and we have remarkable ecosystems, as well. We have marshes and coastal areas, open water and estuaries. And what we learned from the Deepwater Horizon oil spill is that these types of events can be catastrophic for the environment. We still don’t know the total damage in terms of its impact on the biodiversity of our ecosystems. And with the recent BP obtaining the recent lease sales in the northern Gulf of Mexico and now with the South Atlantic becoming available for seismic testing, what we’ve learned is that we just don’t know enough about these systems. We’re going into deeper and deeper water. And we still don’t have a proven method for preventing this type of catastrophe from happening again in the future. AMY GOODMAN: Talk about the state of wildlife, Jackie. JACLYN LOPEZ: So, in the Gulf of Mexico, we have several different taxa. So we have five different types of endangered and threatened sea turtles. We have numerous marine mammals. We know that the bottlenose dolphins have been hit particularly hard with the spill and other activities. The brown pelican was only recently delisted from the Endangered Species Act when the BP spill hit. We have bluefin tuna, amberjack. We have a very vibrant set of fisheries. We have all kinds of reasons why people want to live here, and very few of them have to do with oil and gas development in the Gulf. AMY GOODMAN: In 2012, the National Oceanic and Atmospheric Administration reported dolphins in the Barataria Bay off Louisiana are seriously ill. Well, former Louisiana senator, current oil industry lobbyist, J. Bennett Johnston said the organization is yet to establish a connection between the sick dolphins and the BP oil spill. This is former Senator Johnston speaking on Al Jazeera. J. BENNETT JOHNSTON: What NOAA has said is that there was damage to the dolphins before the spill, there’s damage after the spill, and they think there might be a connection between the spill and the dolphins, but it has not been established at all. AMY GOODMAN: That’s former senator, now oil lobbyist, Bennett Johnston of Louisiana. Your response to that, Jackie? JACLYN LOPEZ: So, in addition to the 4.9 million barrels that were spilled in the two or three months that the Macondo well went wild, we also know that there’s about a half a million to 1.5 million barrels that are spilled annually, without sort of the media attention that the Macondo well, the Deepwater Horizon, had. So we have these ongoing impacts in the Gulf of Mexico, and while perhaps the findings aren’t conclusive, it would be difficult to surmise that the cumulative effect of the different oil and gas activities aren’t harming our wildlife. AMY GOODMAN: Can you talk about the lifting of the ban on BP applying for other drilling contracts now, the EPA doing that? JACLYN LOPEZ: Right. So, we’ve seen that BP has this history of struggling with telling the truth in terms of the amount of oil that was spilled with the Deepwater Horizon and even more recently with the spill in Lake Michigan. BP seems to struggle with its ambition and keeping its oil and gas activities sort of within the bounds of what’s safe for the environment and for humans. And it has repeatedly demonstrated to the American public that it can’t be trusted to be acting on our best behalf. So the request to EPA to reinstate this debarment is on behalf of the American public that has recognized that BP simply can’t be trusted to continue to do business with the American government. AMY GOODMAN: Can you talk about the petitions that you’ve delivered? JACLYN LOPEZ: Right. So that petition is asking the EPA to reinstate this suspension against EPA—or, against the BP. So, following the Deepwater Horizon oil spill, EPA temporally suspended BP while it was investigating the Deepwater Horizon oil spill. And a few months back, BP then sued EPA to lift the suspension. So they reached an agreement which resulted in a five-year probation for BP. And then, just a few weeks ago, we had this other spill up in Lake Michigan, about 1,600 gallons, that just further illustrates that BP is just unprepared to deal with the oil and gas development activities that it seeks to engage in. AMY GOODMAN: Finally, Jackie Lopez, it’s four years later. How do you think BP should be held accountable? JACLYN LOPEZ: We think that the American people have spoke. And that petition was signed by over 50 organizations representing millions of Americans. It was independently signed by another 66,000 people who all recognize that BP needs to be held accountable by being prohibited from future contracts with the American government. AMY GOODMAN: I want to thank you for being with us. Jaclyn Lopez is a staff attorney with the Center for Biological Diversity, speaking to us from Tampa, Florida, from PBS station WEDU. When we come back, Rubin “Hurricane” Carter has died. He became a symbol of racial injustice when he was imprisoned for 19 years. Ultimately, he was exonerated, and he spoke out around the world against wrongful imprisonment. Stay with us. AMY GOODMAN: Woody Guthrie. Woody Guthrie singing “Ludlow Massacre.” Sunday marked the hundredth anniversary of the Ludlow Massacre, when the National Guard attacked a tent colony of miners striking at a Rockefeller-owned mine in southern Colorado. That night, the Colorado National Guard and mine guards torched the camp, and women and children hiding underneath the tents were burned to death, killing dozens. “Remember Ludlow” became a battle cry of the nascent mineworkers’ movement.